We’re always thrilled to be crafting with Scotch® Duct Tape and we’re back with them today using their new designs for Summer! 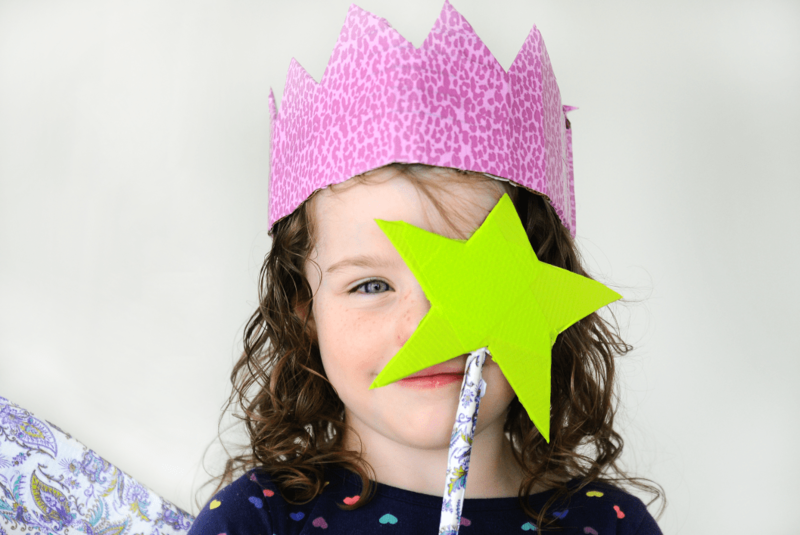 We really stretched the limits today and created a DIY for the dress-up loving princesses in your life. And even better for you moms, you can wear them around all day Mother’s Day to assume your rightful position as Queen for the day! Scotch® Duct Tape rolls in Purple Paisley, Metallic Cheetah and Neon Green. Cut out two pieces of rectangular cardboard, taking zig zag notches out of the tops of both. Lay side by side, notches pointing in the same direction. Then cover both sides with the Metallic Cheetah tape, using tape to connect the two pieces. Once it’s covered and combined, go through each rib of the cardboard and bend to create the rounded shape. Now for the wings! 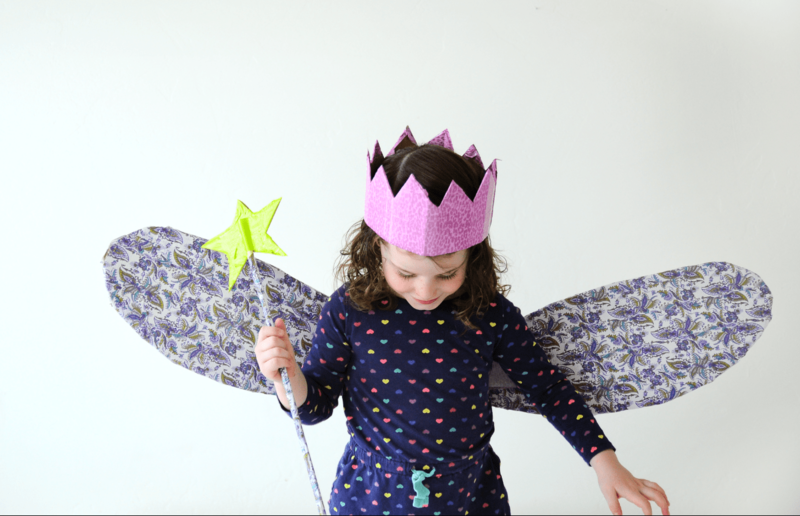 Cut out two identical tear drop shaped wings and cover with tape. Connect the two wings with two pieces of duct tape stuck together. The best part about this duct tape is it’s strong as can be so you can tape down rubber bands, or ribbons to tie around their arms to keep the wings in place. 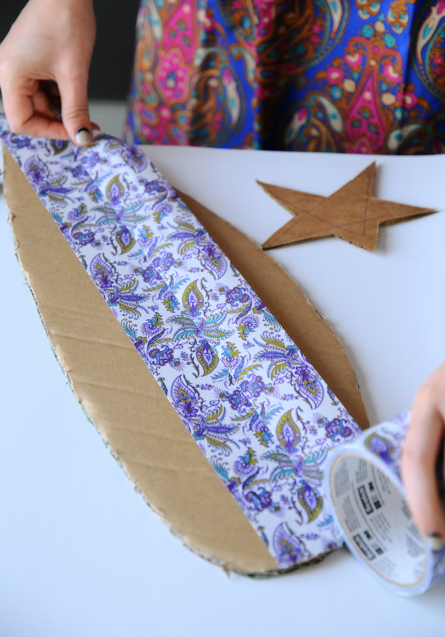 For the wand all you need to do is tape the dowel up and down with the Purple paisley. 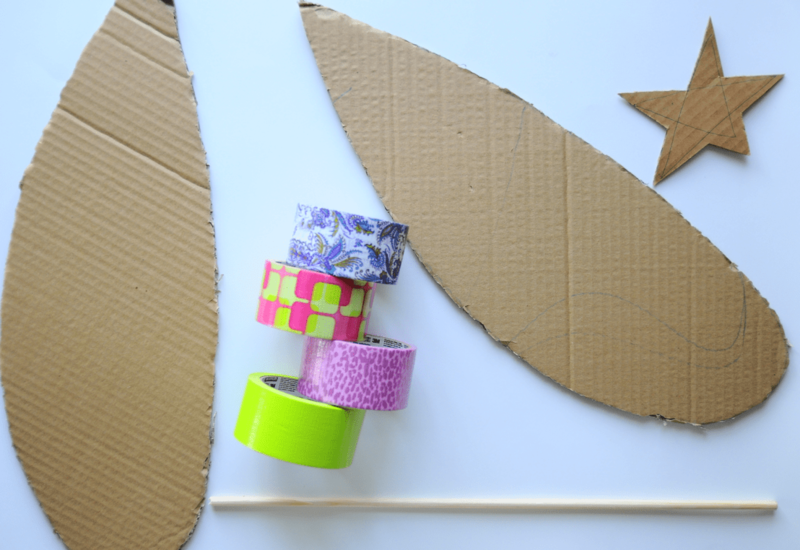 Then attach the dowel to the a star shaped piece of cardboard. Tape the star with the neon yellow simultaneously attaching the dowel to the star. Follow along with some seriously amazing projects on the Scotch® Duct Tape Pinterest Boards and Scotch® Duct Tape Twitter for when they update on new projects and products! We are proud to be a 3M- sponsored blog, and, as part of our responsibilities, we get the opportunity to evaluate new products from Scotch® Duct Tape. 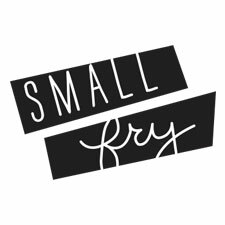 Opinions are our own and additional product used in the project were selected by Small Fry.